1.Do your homework. Congrats! By reading this today you’re already on your way. 2. As exciting as it is to dive in with big plans, be realistic about costs, timeframes and expectations. This will set you, your family and your team up for success. 3. Sadly, not everything can be preserved. When worn condition or vital updates cost original details, don’t be hard on yourself. Instead, thoughtfully incorporate new items alongside salvageable retro treasures. The end result will be a balanced home that is both beautiful and livable. 4. Assemble your team as early as possible. Arrange a tour with your contractor or design team before signing the dotted line so that you all know exactly what you’re getting into. 5. If you already own your home, be ready to adjust the scope of your project or break it up into phases. Not only will this allow dust to settle between installing tile and normal life, but can also allow you time to save up before moving on to the next project. 6. Want to keep original features, like a pink toilet? Consider their long-run maintenance as much as their mid mod charm. If you can’t find a plumber now who carries the appropriate size fittings, it’s likely that you won’t be able to find one later when you’re facing an emergency repair. 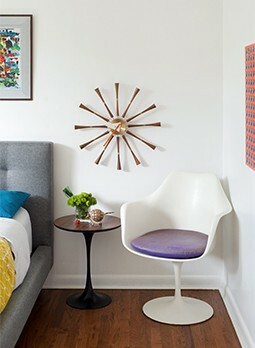 Either find a way to stock up on parts or consider other ways of showcasing midcentury style. 7. If possible, seek out multiple consultations on your renovation projects. 8. When looking at competing bids, ensure that you are actually comparing apples to apples. Bids are likely to include different items and tasks—meaning that the cheapest might not cover everything and the priciest could come down if a few extra items are removed. 9. If you have bought a house that was flipped, updated before hitting the market or simply faced a bad remodel at some point, chances are high that you’re faced with nice but not midcentury items like granite and bland cabinets. Rather than feeling guilty for tearing out otherwise good materials, send them off to your local ReStore or post them on a community website so that other home renovators can make use of the materials. Feeling overwhelmed by your renovation? Take heart, we know you can do it! For a little inspiration, read the story of homeowners who tackled the renovation of both their home and guest house.